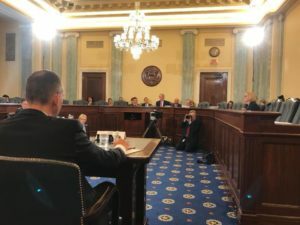 I testified on Wednesday to a senate committee about Space Science and especially about research we do in regards to “finding life beyond Earth”. Ellen Stofan, David Spergel, and Sara Seager were expert witnesses with me – it was an honor to be on stage with them. Each of us was asked to respond and – I believe – together we came up with the most compelling answer I ever heard to this question. So, why is it important for NASA – National Aeronautics and Space Administration to search for life beyond Earth? 1) It is to make history – answering this question in a compelling way will be one of the most important breakthroughs in science history. It will not only change what we know, but how we think, as a human species. At NASA, we want these breakthroughs to come from the USA. 2) It is to drive transformative industries – asking big and very hard questions has benefits that we cannot even guess. The internet, integrated circuits, and so many transformative technologies came from asking big science questions and reaping the benefits. This is not about creating a few startups, it is by opening up new, paradigm altering Industries. 3) It is because this question matters to everyone. Everybody is affected by this question somehow, no matter what the background. Together, this can provide motivation to engage and inspire and connect to science in a fashion that is rare. 4) It is because working on this question can inject a whole new workforce into the STEM community, a workforce that will advance prosperity and well-being of all similar to the transformative effect they the Apollo program had onto the US economy. This is precisely why we see this question as one of three themes that drive all of NASA science!